Readers of my blog will have noticed that I enjoy sharing stories about “little blessings”. These stories are very important and special to me. The next two stories are little things that became bigger. One day a friend from church gave me a small package wrapped in brown paper. On the paper she wrote, “I thought of you when I saw these dear friend. You will make them pretty.” I know her exact words, because I kept the paper. I was so touched by “dear friend” and built up by her compliment that I would make the gift pretty. This was during a time when I felt worthless. I knew that I was capable of many things, but I had been through a tough situation that shattered my confidence. God used her compliment to build me back up. Reminding me of who God made me to be. What was the gift you ask? 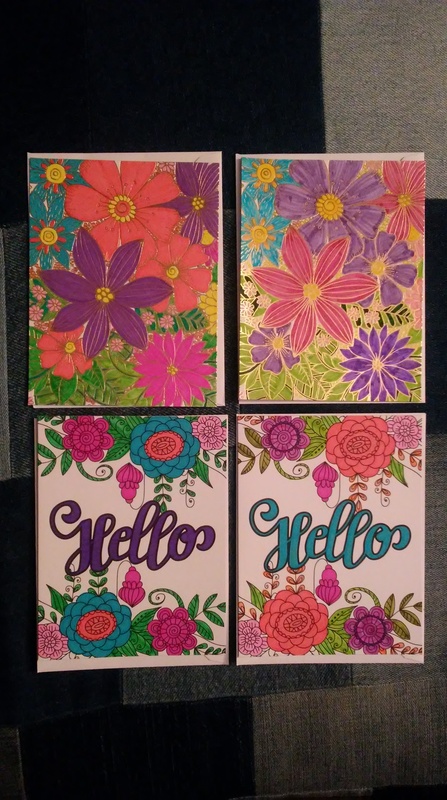 Two packages of cards that need to be colored. One of my favorite things. I remember the story every time I color one; I remember how this friend invested in me. This next story happened while I was working two jobs. I had posted a request on Facebook about the gutter on one side of my house (it was falling off). When I got home that night (after my second job), I found someone had taken the gutter off the house. I was blessed that someone had taken the time to help. I did not realize the full blessing until the next day. Someone had mowed my lawn and removed some bush trimmings that I had left. That summer mowing the lawn was hard due to the food issues I had not figured out yet. One week of no mowing was a nice treat. I enjoy storytelling so I take great pleasure in sharing these stories. However, I also hope to encourage my readers to consider this with others. Both when you have the opportunity to give and when you receive. The little things matter. God uses them in big ways for His honor and glory.